Main product of the fermentation process is biogas, however digested biomass can also exist as a product - it depends on the prooper usage. The composition of the digestate depends on the substrates which constitute the input to the biogas plant. Depending on the type and proportionos of individual thickening and performance cosubstrates, also the digestate will have higher or lower ferilizer value. Digested biomass can be separated into two fractions: solid and liquid. Liquid phase can be reverse to the process as recyrculate (dilution and bacteriological functions) or can be used for the agrigultural field irrigation. Moreover solid fraction can be used as ferlilizer. Analysis of created post-fermentation waste allows its management improvement. In the laboratory our experts measure contamination of: N, P, K (nitrogen, phosphorus, potassium), Na, Ca, Mg in fermentation residue. Moreover prameters such as pH, conductivity, dry mass and dry organic mass should be analysed. Analyzing above-mentioned parameters it can be concluded that the fermentation mass meets the criteria for suitability for fertilization. To agricultural farms which want to build biogas plant we refer examination of biowaste which would undergo controlled methane fermentation process. The biomass is examined due to the quality of produced biogas, the digested biomass is analyzed due to its fertilizing utility. 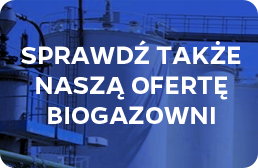 This examination allows adjustment that work of the built biogas plant would be effective and thereby profitable.